We just got back from our annual Utah pilgrimage on Sunday evening. We were gone a little over a week. The drive out and back is sooo long but over all the kids did ok. We packed a lot in to our time there, doing things like visiting BYU bookstore, swimming, barbecueing with family, eating Gandolfo's sandwiches, and working on my sister's new roof. I got to go to a fun quilt shop while we were there, Corn Wagon Quilt Co. I bought some (more) Figgy Pudding Christmas fabric, some Snippets oranges for my daughter's baby quilt, and some fabrics for 4th of July skirts and dresses for my baby and her cousins. I made a 4-tiered skirt for my niece, and Mom and Tami and I started on peasant dresses for our two baby girls. Our oldest niece came too and had her first experience using a sewing machine. She was a little intimidated at first but she did great! I helped her make a... scrunchy. It was all her idea. She's 11 and apparently scrunchies are coming back. I finished my baby's dress yesterday and will post a photo soon. I will have my sis email a picture of her daughter's skirt too, so I can show you that. A while back, I listened to a good episode of the Quilting Stash podcast. 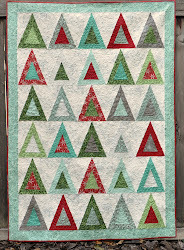 It was an interview with Diana McClun and Laura Nownes, the authors of Quilts, Quilts, Quilts. This is the first quilting book I bought, probably in 1997 or 98, and it's still one of the best ones out there for learning quilting basics. It was really interesting to hear the authors' voices and learn the story of how Quilts, Quilts, Quilts came about. Glad you had a great trip, Vic!